Donald Trump thinks the NFL is soft, like America. 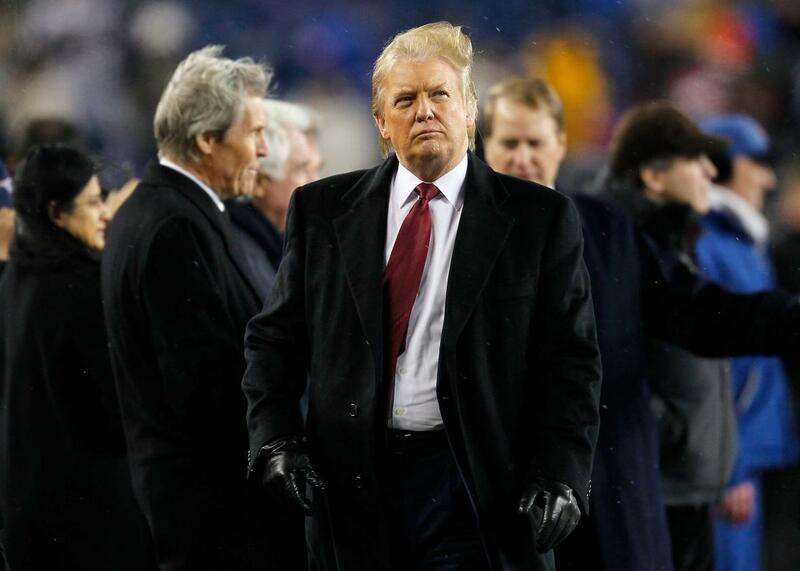 Donald Trump stands on the sidelines as of the New England Patriots and the New York Jets warm up prior to their game at Gillette Stadium on December 6, 2010 in Foxboro, Massachusetts. One of the most horrifyingly violent NFL playoff games in a very long time was played over the weekend between the Pittsburgh Steelers and the Cincinnati Bengals. Republican pole sitter Donald Trump feels that the violence wasn’t horrific enough, though. During a speech at a Reno campaign event on Sunday, Trump said the fact that some of the players who made extremely vicious hits in Sunday night’s game were penalized for those hits is further evidence that the country is no longer great again. It sounded as though Trump was referring to Bengals linebacker Vontaze Burfict flying shoulder-first into Antonio Brown’s skull pan, which resulted in a pair of penalties that allowed the Steelers to kick the game winning field goal. Here is video of the stuff in question, along with Brown lying on the ground concussed. Trump made the exact same argument about the league being “soft” back in 2014 after a failed bid to purchase the Buffalo Bills. He also famously owned the New Jersey Generals in the USFL and has been widely credited with essentially destroying that fledgling league by pressing for an antitrust lawsuit against the NFL that ended in disaster for the smaller organization. Donald Trump: Good for football, good for America.